Khris Davis led off the 10th inning with his major league-leading 42nd homer, and the Oakland Athletics beat the Tampa Bay Rays 2-1 on Friday night. 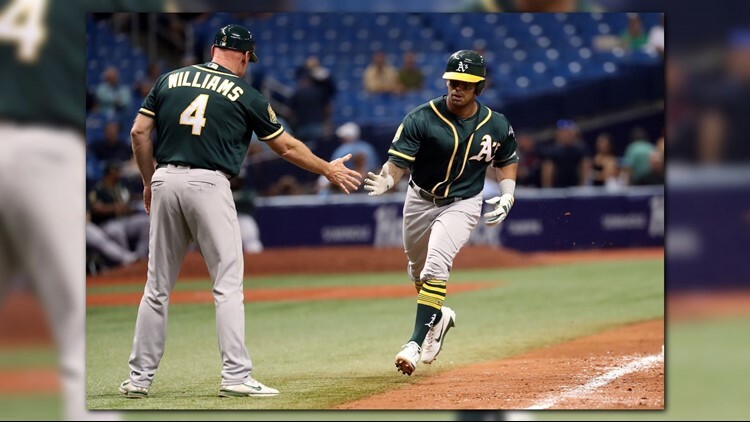 ST. PETERSBURG, Fla. (AP) - Khris Davis led off the 10th inning with his major league-leading 42nd homer, and the Oakland Athletics beat the Tampa Bay Rays 2-1 on Friday night. Oakland extended its lead for the second AL wild card to nine games over the surprising Rays. Tampa Bay has 16 games left. The A's remained 1½ games behind the New York Yankees for the first wild card. The Yankees beat Toronto 11-0. Davis' drive to center off Jaime Schultz (2-1) was his 40th this season as a designated hitter. He joins David Ortiz has the only DHs to have 40 or more homers. Oakland had just three hits against nine Tampa Bay pitchers. Blake Treinen (7-2) went two scoreless innings for the win. Matt Chapman doubled for the first A's hit with one out in the fourth and scored on Matt Olson's single. Tampa Bay tied it later in the fourth when Tommy Pham extended his hitting streak to 17 games with a pop-fly double into shallow center field and crossed the plate on Joey Wendle's base hit. Oakland reliever Shawn Kelley worked out of a second-and-third, no-out jam in the sixth. Athletics starter Edwin Jackson allowed one run and four hits in five innings. Reliever Diego Castillo opened the game for the Rays and struck out four over two perfect innings. Sergio Romo retired all three batters in the ninth in his second appearance for the Rays since Aug. 25. He recorded a two-out save on Sept. 4 at Toronto. The Rays have put out a handbill supporting Blake Snell's AL Cy Young Award bid titled "Attack of the Cy Zilla!" It includes a quote from Boston manager Alex Cora saying Snell has "been great against everybody." Red Sox lefty Chris Sale is also a contender. Snell, whose nickname is Snellzilla, leads the majors with 19 wins. Chapman has 23 doubles and 38 extra-base hits since the All-Star break. ... Oakland C Jonathan Lucrory threw out two runners on stolen base attempts. ... Athletics RF Stephen Piscotty had his 14-game hitting streak end after going 0 for 4. Athletics: RHP Trevor Cahill (upper back) will miss his next scheduled start. "He had a trigger-point injection," manager Bob Melvin said. "Hopefully that alleviates it." Rays: 3B Matt Duffy (lower back) started after being out of the lineup the previous three games. "I don't think the pain is completely out of there but he wants to be in there," manager Kevin Cash said. Tampa Bay and Oakland, two of the primary teams using relievers as openers to start games, will employ the strategy against each other for the first time Saturday night. "It's just trying to take advantage of what you have," Melvin said.